– Free time – can explore night Life activities at you own. – You will know more about history and development of the southern capital of Kazakhstan and see its major attractions:, Palace of President, Republic Square and Monument of Independence, and Astana Square, Panfilov Park, Abai Square and Palace of Republic, Presidential Park. – 1430 Hrs Continue Almaty City Tour, Rakhat Chocolate Factory and Local Market Zilyoni -Bazar. – Time to Relax a bit after long walk. – This tour provides you the best opportunity to see the beautiful mountain surroundings of Almaty city. The first stop of the tour awaits you in the Medeo Gorge, where in the wonderful mountains of Trans-Ili Ala-Tau the largest high mountain skating rink in the world is located as well as the huge dam, protecting the city from destructive mudflows formed on the tops of the western Tien Shan. Next destination is Chimbulak ski resort (Cable Car Fee Included), located at an altitude of 2230 meters above sea level. It is very popular for its mild climate, large quantity of sunny days and snow through the winter and remarkable scenery of mountain ranges. – Free time to Look Around!!!! – Free time at your own. – 1030 Hrs proceed towards the tour of Kok – Tobe. 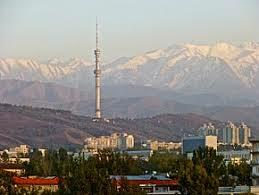 It is a mountain which is the highest point of Almaty, Kazakhstan’s largest city. There is a popular recreation area on top of the mountain. The mountain’s height is 1100 meters above sea level. Kok – tobe is one of the main landmarks in the city, and it is popular among visitors and tourists to Almaty. The Kok – Tobe recreational area has a variety of amusement park type attractions and restaurants. It is connected to downtown Almaty by a cable car line. The City Terminal is located near Hotel Kazakhstan. Also, there is a 372 meters tall TV Tower at the foot of the mountain. The tower can be seen from most parts of the city. – 0345 Hrs Checkout from hotel. – 0720 Hrs (KC 907) Departure from Almaty. – 1110 Hrs (KC 907) Arrival in Delhi. Visa Takes minimum 20 working Days.A Copy of Passport and Employment Letter is required at the Time of Booking and later followed by 02 Original Passport Size photographs with White Background and Original Passport.Visa issuance is the sole right of Embassy of Kazakhstan.Return Air Tickets and Hotel Vouchers are required at the Time of Visa Processing. 1 USD = INR 74. The prevailing Rate of Exchange of the day of payment will be applicable.